I believe I was 22 at the time, I was at a club with my friends dancing and having a good evening. This guy comes up to me and says "We're going to dance before the night is through" and walked away. I thought to my self the nerve of this guy and waited patiently for him to come back...lol. When he did, we danced the whole night. We exchanged numbers and the next morning he called me. We spoke on the phone for hours and he invited himself to go ice skating with me and my friends. We had a wonderful time and made plans for a second date. Our second date was a dinner date. This is where the story turns. We went to Tavern on the Dean, nice quaint restaurant in downtown Brooklyn. We ordered appetizers, entrees and had some drinks. As the time rolled around for the bill he started making some glances at the back door. This restaurant had two exits. He said to me....get this!.. "We should walk out the back door." I laughed, until I saw the expression on his face. He was serious. 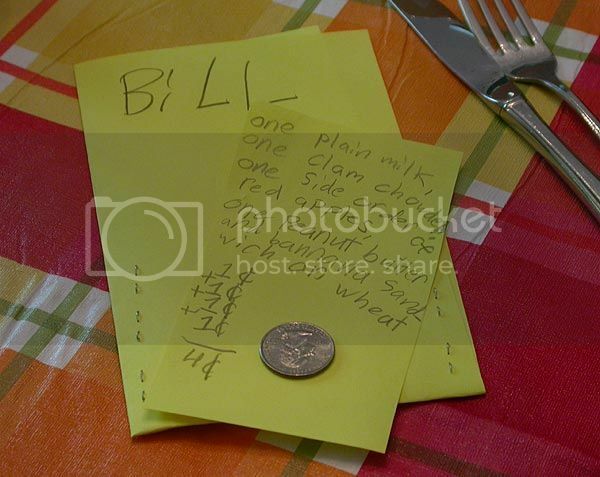 The bill was placed on the table, the meal came up to around 95 dollars, if I remember correctly. HE OPENED HIS WALLET AND IT WAS BARE, like a desert bare. I pulled out my debit card and paid the bill. Moral of the story...Thank God for a mother who taught me to always have money when you're going out on a date.